As you look around the farm, you see the special little touches of decor that help create that rustic and homey feel from the moment you step foot onto our property. Whether it is our flower filled wheelbarrow, our wide array of unique signage, or our vintage treasures around every corner….we have helped to set the mood for you and your guests before they even sit in their seats! The Dazzle Approach is decorating all aspects of your wedding layout and weaving your theme in all areas….what is considered a cohesive full spectrum approach to your wedding day. It creates a consistent look and gives attention to the details of each area from sign in/gift area, photo display, ceremony embellishments, reception tables, cake area, favors station, sparklers – a comprehensive full approach to decorating for your day. It pulls a theme together and your color scheme too. It has lots of options in theme – vessels – flower types – and accessories. Nothing is cookie cutter and begins with viewing a few (yes – a few Pinterest pictures in each category; i.e. reception tables, ceremony aisle, sign in, plus a couple of more). I swear I have Pinterest living in my basement with a multitude of options. I can embellish or reign in but I certainly DO want to dazzle you when you pick this option! Adding an Arbor or Cross? Then. ..the Simplicity Approach is a way to stretch those dollars while concentrating on the table decorations and down the aisle accents. It allows us to do our magic with less hauling in of extra decor but still impress. It prioritizes the essentials yet with beautiful results. Most of our brides love the farm fresh flowers and with such varieties for us to choose from, we can fit your color scheme as well. 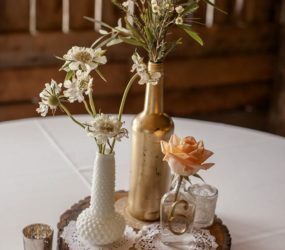 Even if we need to buy a few specialty flowers – the freshness and uniqueness of utilizing our farm flowers makes for an unforgettable look….and keeps the budget under control. It includes reception tables/decor, ceremony embellishments, setting up a simple sign in/gift area, utilizing our freebie stall as much as possible with signs and such, and reserving a few flowers for your cake table as well. Email me (Margie) at highpointfarms@gmail.com to let me know you are interested so I can check my availability and give you a general quote. I chat, swap Pinterest boards so I can visually see your style, and then we begin discussing options. 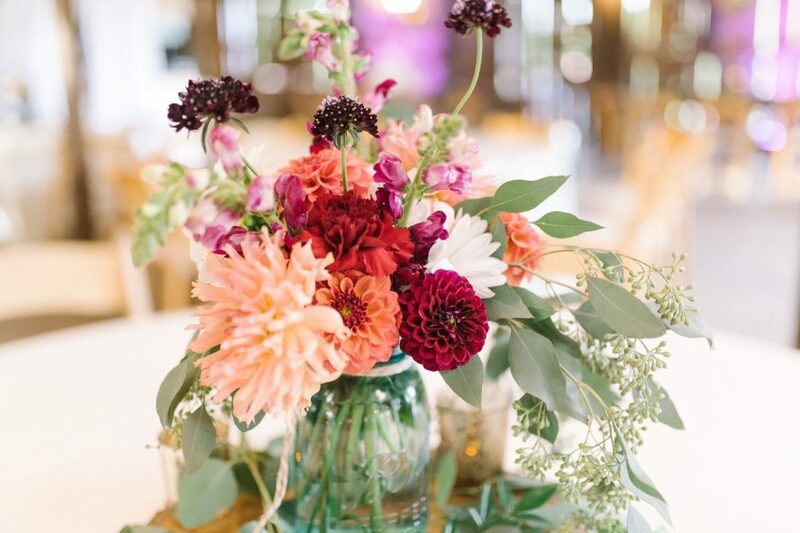 We can handle all of your flowers needs from table decor to bouquets by using our own farm flowers or purchase complimentary flowers to achieve the desired look. High Point Farms Creates Bouquets Too! This venue is unreal! The beauty of their barn and the property it sits on is overwhelming, and the services and options the provide are top-notch. The Barn was the first venue I visited and we signed the contract that day and I have not one regret! I have heard from almost every guest who attended and all they can do is talk about how gorgeous the entire wedding was and I agree with them 100%. One of the options they offer is decorating services – Margie went above and beyond my expectations in every way. I had such a difficult time explaining my taste and what I wanted and I was worried she would not fully understand what I was going for, and after my OCD got the best of me I decided to take a step back and let Margie and my mother handle the rest which was the best decision I could have ever made. Margie COMPLETELY understood my vision and she literally made it come to life! Looking back at all the photos makes me so emotional because she truly made my wedding day perfect in every way. Her daughter, Jill, is one of the most patient and sweet women I have every encountered (I am so sorry for my unruly bridal party) and Margie’s husband is an incredibly kind man. They all make an amazing team and they will go above and beyond to make your day special and everything you ever dreamed of. I cannot say enough good things about this family and their venue…it was the greatest day of my life and they had a huge part in that.